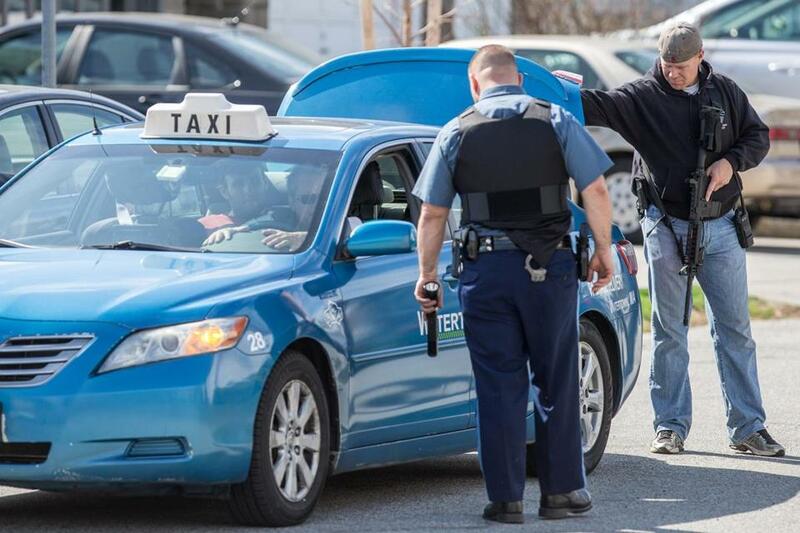 State Police officers stop a car at the intersection of Carver Road and Belmont Street in Watertown while searching for one of the two marathon bombing suspects. 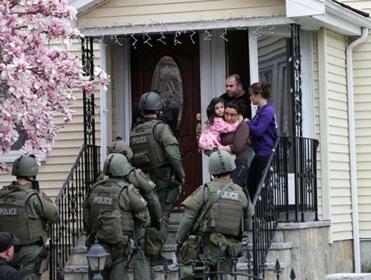 Nearly one year after SWAT teams and armored trucks moved through Watertown neighborhoods in search of the two Boston Marathon bombing suspects, some residents who were caught up in the traumatic events last April 19 say authorities still owe them answers. S.W.A.T. teams conduct a house to house search in an area near last night's shootout. The forum last Wednesday night in Watertown was held by the Massachusetts chapter of the National Lawyers Guild, some of whose members have questioned whether some actions by law enforcement officers during the manhunt were unconstitutional. Early on April 19 last year, four days after two bombs near the Boston Marathon finish line killed three and wounded more than 260, suspects Tamerlan and Dzhokhar Tsarnaev engaged police in a fierce gun battle in Watertown. Tamerlan was killed but his brother, Dzhokhar, escaped and became the subject of an intense manhunt, leading to an areawide shelter-in-place order until he was captured that night in a boat in a Franklin Street backyard. Watertown Police Chief Edward Deveau said the Police Department has been limited in what it can make public as federal prosecutors prepare for the trial of Dzhokhar Tsarnaev. “We have the trial coming up in November, so we’re under the guidance of the US attorney’s office on what we can and can’t say,” he said. Deaveau also said the Massachusetts Emergency Management Agency is preparing a report on everything from the bombing to Dzhokhar Tsarnaev’s capture. Deveau said he was disappointed that police representatives were not invited to the forum, but he said he was not aware of any lawsuits or formal complaints against the department relating to the manhunt. “Our officers in the middle of the night defended Laurel Street, saved lives, and protected our freedom,” he said. “One of those freedoms is the right to gather and criticize, like they did the other night.” Deveau said the group that gathered last Wednesday was a small one, but much larger groups have praised the police for what they did. About two dozen people gathered at the forum and several spoke of the fear they felt during the police operation. One Franklin Street resident, who did not want her name published, said she felt uncomfortable with how police used military tactics during a search for the alleged terrorists, which she said struck fear in the hearts of locals. Marta Manzelli, who lives on Center Street — close to where Dzhokhar Tsarnaev was eventually found — said she has recently been diagnosed with post-traumatic stress disorder due to the events. Manzelli said that after being cooped up in her home for 11 hours on that April day, she shuffled downstairs in her bathrobe to check on her neighbor. She said she was greeted gruffly at her front door by men clad in military wear and holding guns, who yelled at her to go back inside. Manzelli said she still could not believe the police did not capture Dzhokhar Tsarnaev immediately after he was wounded in the gunfight. Benjamin Falkner, a member of the guild’s litigation committee and a panelist at the event, said police usually need individualized suspicion before searching a house or arresting someone. But he said that on April 19, authorities seemingly cherry-picked houses to search for the younger Tsarnaev brother, intimidating residents with militarized tactics. Lawyers from the guild said they knew of no formal complaints filed against police because of the manhunt. They encouraged residents to urge their elected officials to ask Watertown police for specifics about the lockdown and search process. The executive director of the Massachsuetts chapter of the guild, Urszula Masny-Latos, said after the meeting that it is too soon to tell if the guild will move forward with legal action. “We are open and available to talk to people, but we are not necessarily looking” for a lawsuit, she said.